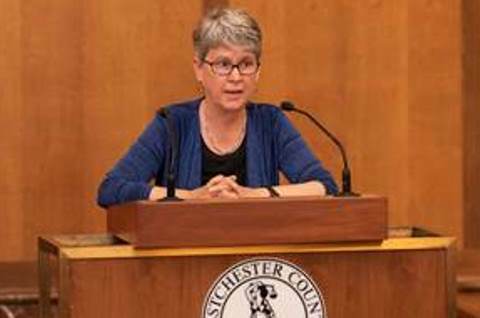 White Plains, NY — Legislator Kitley Covill (D - Bedford, Lewisboro, Mount Kisco, North Salem, Pound Ridge, Somers) is happy to report that a new law raising the age for the purchase of tobacco and related products in the County from 18 to 21 is working in our communities. Recently, Westchester County Police sent a youth into two stores in Mount Kisco as part of a compliance check to ensure that the shops, which sell tobacco and vaping products, were complying with the County law. One of the two shops visited, Smoking King of Mount Kisco, at 32 E. Main St, was cited Tuesday for selling vaping products to a minor. The other shop, Kisco Vapors at 145 E. Main St., properly denied service to the underage youth. In June, the Board, with Legislator Covill’s full support, passed legislation that raised the age for the purchase of tobacco and related products in the County from 18 to 21. This important law was put into place in order to protect the children of Westchester. The law went into effect in August. Just last week, the Environmental Protection Agency announced that nationwide youth vaping had reached epidemic levels.